Traditionally fencing was used to mark out the boundaries of the property and to keep children safe on the inside, but fencing has evolved over time and is like a hobby to quite a lot of people. 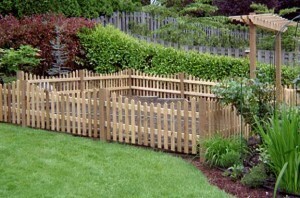 So if your garden needs to fencing fitted our gardeners are the best choice to help you. We have anything from traditional garden fence panels to acoustic fencing the options are almost endless. If you have a little part of the garden you want to keep separate e.g. keeping children out of or pets out of, then you could even have our traditional garden fencing or our metal garden railings. With all of these options of fencing the possibilities are almost endless, so you could have the garden that you or your family deserves and our professional Gardeners in St Helens would be with you each step of the way, providing their up-most best work to suit you.